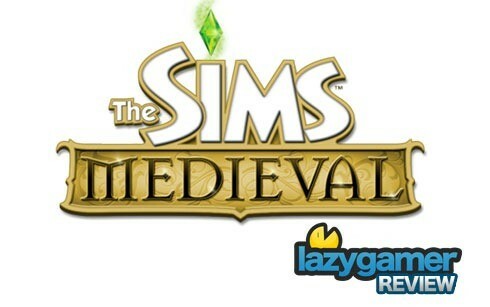 The Sims Medieval is a stand-alone game, though it may well spawn its own line of expansion packs. For veteran Sims players like myself, it’s a breath of fresh air. The focus here is not on micromanaging every moment of your Sim’s existence and sending them to the loo every few minutes. Instead, it mixes in a few elements of roleplaying to make things a bit more interesting. You take on the role of the Watcher, the deity watching over the land of the Sims (much like the mysterious hand in Black and White). This is the first reference in any Sims game to a deity of any sort, or indeed to the player. And unlike other Sims games, you are in control of a single Hero Sim, (though you very occasionally control two or three Sims). Hero Sims are different from your average Sim. There are several Hero classes to choose from, including Monarch, Knight, Spy, Blacksmith, Merchant, Bard, Wizard, Healer, and priests from the two opposing religions (both worship the Watcher, each in their own special way). A hero has a building associated with him, like the Monarch’s castle, which also serves as his home. Heroes gain experience as they go about their daily activities and complete quests. Levelling up increases a hero’s general proficiency in their class-specific tasks, as well as unlocking new abilities. 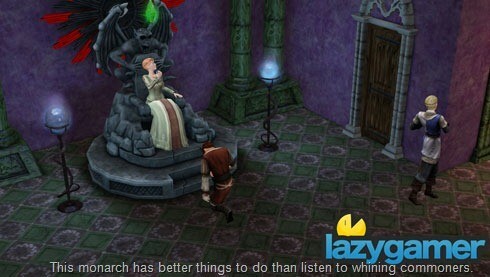 If you enjoyed the Sims 3 expansion, World Adventures, the Sims Medieval will appeal to you. It features a simplified needs system and introduces a variety of different kinds of quests: everything from setting a genie free to assassinating the impostor on the throne. Quests are the basis of the game: you select a quest by spending some of your limited Quest Points, and gain rewards for the kingdom based on your hero’s performance. Choosing quests becomes a matter of weighing up the Quest Point cost against the potential rewards if you succeed. Success earns you Renown Points, which you can use to add new buildings (and their associated hero) to your kingdom. Build Mode is gone, replaced with Kingdom Mode which simply allows you to place predetermined buildings in predetermined places. If you enjoy building, this may not be the Sims game for you. There is plenty of medieval style furniture, however, if you want to refurnish the existing buildings. You can even give them a fresh coat of paint. 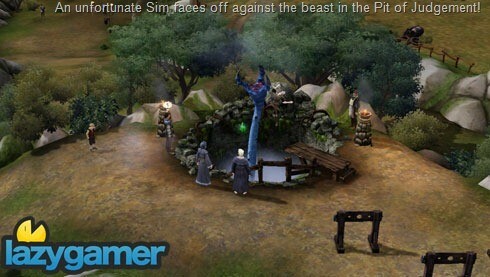 The game uses the Sims 3 engine, which looks great even at lower graphics settings and runs well even on laptops. The only loading screens you’ll see are when you actually start the game and load up your save. There might be a slight pause when switching to the interior of other buildings, but overall, the game runs very smoothly. Create-a-Sim mode is as detailed as that of Sims 3, but with an array of medieval outfits to choose from, depending on the Sim’s hero class. In fact, completing certain tasks in the game unlocks a few other outfits. Sims in this game do not age, though you can make them look older or younger when you create them. They have two traits that define their personality, as well as one fatal flaw that can affect their moods or their interactions with other Sims. The quests you have to choose from are based on what heroes you have available, so as you add more heroes to your kingdom, new quests become available. Once you complete a kingdom (by running out of Quest Points), you have the option to play freely, with or without quests or other pesky responsibilities. Or you can start a new kingdom with a new goal. The only problem with this is that you are likely to come across quite a few of the same quests you saw last time round, which can be a bit boring, especially with the longer quests. Your kingdom is pretty big, so there is plenty for your Sim to do and explore, from collecting leeches and herbs for crafting medical supplies, to embarking on an adventure in the nearby forest. There are a few areas, like the forest, where your Sim goes off on his own and returns after a little while – room for expansion packs perhaps? On the positive side, there are shortcuts for you to jump to the various locations around the kingdom quickly, then you can just click to send your Sim there. On the down side, it can take them forever to walk all the way to you! The game has very few bugs apart from the very rare crash or freeze, and the usual pathfinding issues that all Sims games suffer from. Some of the quest objectives can be a bit obscure, leaving the player wondering what on earth they should do next. On the whole, the game is very stable and is pretty clear on what you should be doing. Overall, I really enjoyed this game. After playing just about every Sims game since the original Sims, I was starting to get a little bored with the usual â€œbuild a house, get a job, have kidsâ€ routine. This is something different, while still being the Sims we know and love. It may not appeal to everyone, but it’s one of my favourite Sims games in a long time. The new roleplaying elements and the simplified needs system means that players have a lot more freedom when directing their Sims. It makes for a rather different, but fun experience. The Sims and their environment look good even on lower graphics settings. You might find the repetition of quests a bit boring after a while, but there’s enough variety to keep you going. 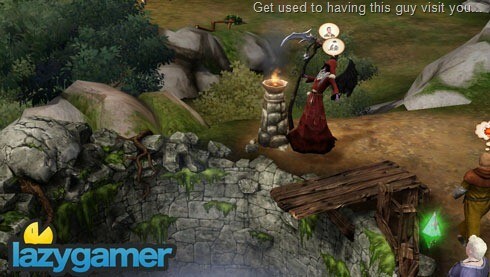 Different in a good way, this game might appeal to those who don’t usually play Sims games. It’s definitely a nice change, and if past Maxis games are anything to go by, will probably see a line of expansion packs in the future.